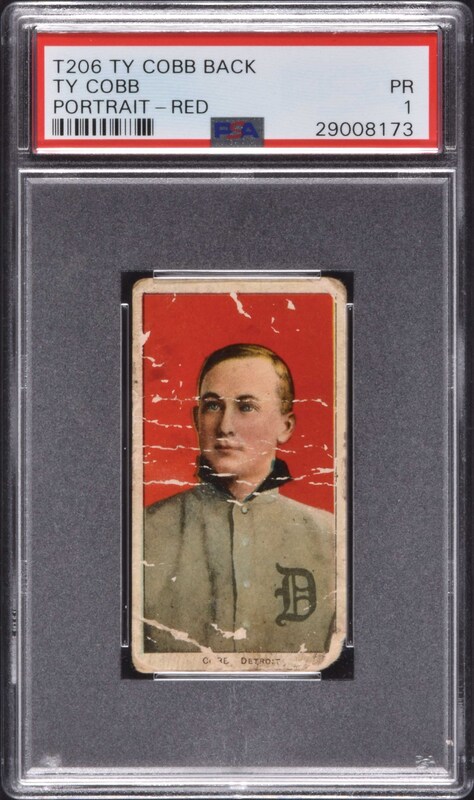 Lot # 1: 1909-1911 T206 White Border Ty Cobb Portrait Red Background with Ty Cobb Back - Newly Discovered! Presented is a newly discovered example of one of card collecting's most legendary rarities: The T206 Ty Cobb with "Ty Cobb" back. For many years there were only fourteen examples of the Ty Cobb with the "Ty Cobb" back known to exist until a number of exciting finds in recent years, which has pushed the total to fewer than 24 known. This very pleasing example is encapsulated POOR 1 by PSA due to heavy creasing and rounded corners. The reverse is fairly clean, with only some light soiling, but it is free of any of the severe tobacco stains, water damage, or writing that plagues some other examples. There is no paper loss. 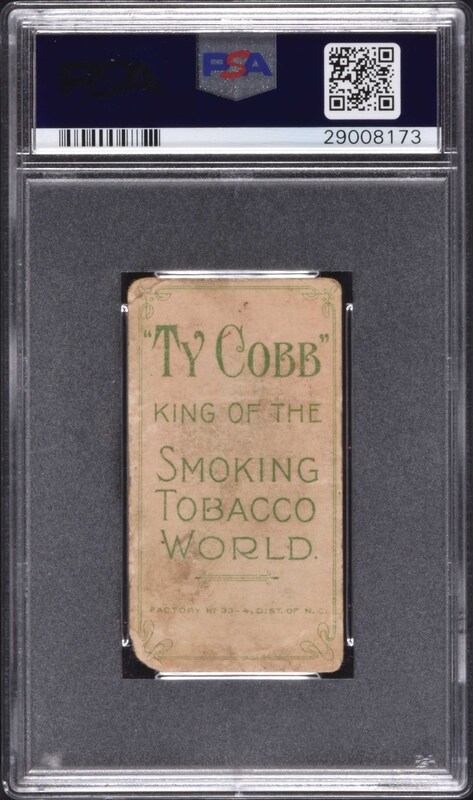 The important advertisement is boldly printed in green ink, which is of course of monumental significance on an ideal Ty Cobb card with "Ty Cobb" Tobacco back. Despite the obvious condition flaws, the card has a striking appearance and still displays bold colors and perfect registry. It will never be mistaken for a Mint card, or even a Good condition card, but it has an undeniable visual appeal nonetheless and we do believe this extraordinary rarity will be appreciated for what it is, condition faults and all: one of the most legendary rarities in all of card collecting. Exactly how these cards were distributed has always remained one of the great mysteries of the card-collecting world. The T206 set is the premier set of the era and the single most significant and widely collected of all baseball-card sets. The T206 Ty Cobb with "Ty Cobb" back card is, of course, actually considerably rarer than the famous Honus Wagner card from the same set (approximately sixty-five T206 Honus Wagners are known to exist as compared to fourteen Ty Cobb with "Ty Cobb" back examples). A strong case can be made that the T206 Ty Cobb with "Ty Cobb" back should be assigned its own catalog number as a "one-card set," but due to its great similarity to the T206 series, this card has always been considered a T206. This is a very presentable example of one of card collecting's most significant rarities. Reserve $25,000. Estimate $50,000+.